In 1914, a young couple decided to take a risk, and they opened a shop in Old Bakery Street, Valletta, selling perfumes and cosmetics. Back then, it was a small shop with a few regular customers, but over time, it started to gain more and more popularity. Rosina Depares was particularly gifted with making wigs using natural hair and this added to the shop’s popularity. Being in the heart of Valletta, the shop also became a prime location for hiring costumes, particularly during the carnival season, and occasionally for performances at the Royal Opera House. By the time the couple’s son, and his wife, took over the business in 1949, Rosina Shop had already made a name for itself in Valletta. The shop in Old Bakery Street continued to stock perfumes, wigs and cosmetics, but Joe Depares and his wife Violet, decided to introduce something new to the brand. They branched out and opened a second shop in Old Bakery Street, in 1952. Before long, Rosina Shop found its place among the top fashion shops in Malta in the second half of the 20th Century. The shop was particularly known for its unique and custom dresses, wedding gowns and hats, most of which were handmade by the dressmaker herself, although the shop also stocked costume jewellery, artificial flowers, children’s clothes, and continued to sell cosmetics and perfumes. With the shop’s growing popularity, Joe and Violet wished to carry on Rosina’s legacy, and in the span of five years, they opened an additional two shops: one in Tower Road, Sliema in 1966, and another in Zachary Street, Valletta in 1971. The shop continued to stock clothing and jewellery, some of which were handmade, and some of which were imported from Paris, Florence, Milan and Dusseldorf. Unfortunately, by 2000, all four shops were closed; however, the dressmaker is still active. 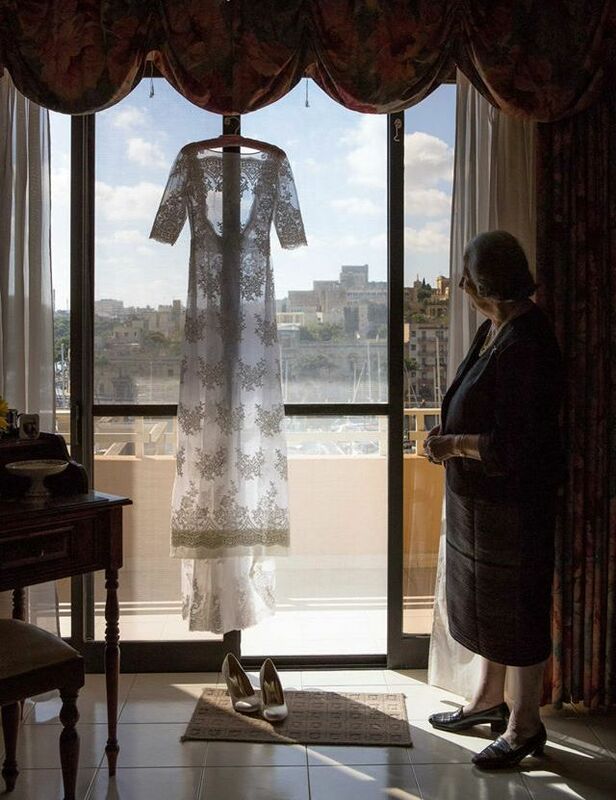 Violet, now 83 years old, recently sewed her granddaughter’s wedding dress from scratch. The last time she sewed a wedding dress was over 20 years ago, and though she admits that it was a long and somewhat tiring process, she says, with a sparkle in her eye, “It took me back to the days of the shop. It took me back to when I would hear a person in the street complement another’s hat, or dress, or jewellery, and the other would say ‘Thanks, I got it from Rosina’”.